We report a contactless method for diffusion length measurement for perovskite single crystals using a material platform of quantum dots in perovskite single crystals. We also report independent measurements of mobility, diffusion length, and trap state density with high accuracy. The performance of optoelectronic devices such as solar cells and light-emitting diodes is determined by the charge carrier diffusion length in the semiconductors from which these devices are made. Perovskites have demonstrated extraordinary optoelectronic properties that underpinned their promising performance in photovoltaics and LEDs. It is of particular interest to study carrier transport properties within single crystals of halide perovskites, in order to estimate how much room for improvement there is for their polycrystalline counterparts. Until now, the minor carrier diffusion lengths within perovskite single crystals have been estimated either by probing the photocurrent in photovoltaic devices; or by using independent electrical and optical measurements to acquire the carrier mobility and lifetime, respectively, which are then combined to calculate the diffusion length. 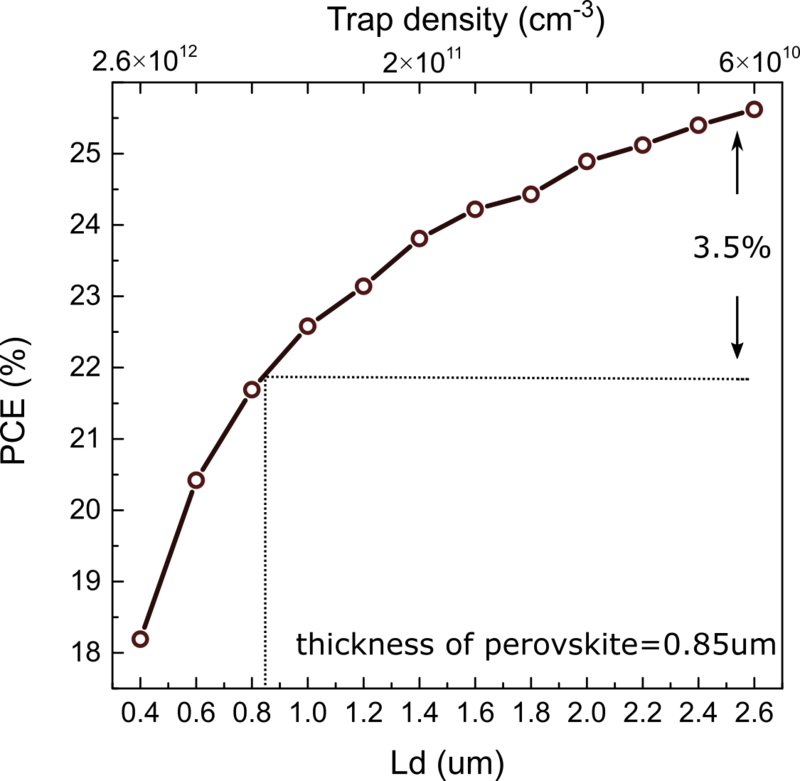 The reported diffusion length values vary widely - from a few μm to several mm - for ostensibly the same materials. 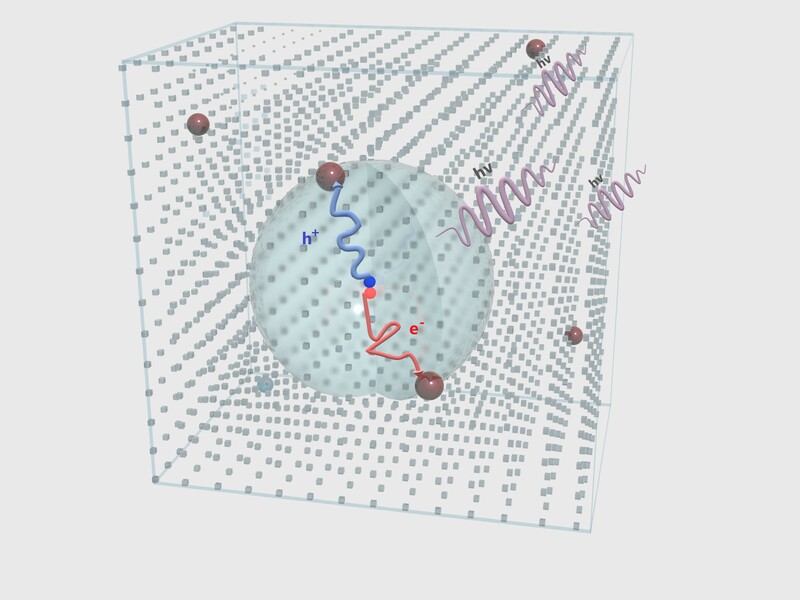 This wide range of findings calls for a method that directly measures the diffusion length itself and that does not depend on unpredictable electrical contacts, which induce chemical modification of the interfaces. We therefore thought: is it possible to probe the perovskite single crystals in a contactless manner? We know that in order to quantify how fast a carrier diffuses, we need to know how long it takes (corresponding to the carrier lifetime) to travel a certain distance. However, it is not straightforward to find a means to control the lifetime and transport distance of photocarriers generated within perovskite single crystals and read out their values. During a conference break in 2016, we had a brainstorming session that lead to this wild idea: we will embed some reporters inside a perovskite single crystal to control and report the behavior of the carriers (Figure 1). We sought to vary systematically the physical distance traveled by photocarriers before recombining, allowing us to see how this influences the excited state lifetime. We would determine thereby the diffusion coefficient within perovskite single crystals. Combining this coefficient with the lifetime of pure perovskite single crystals would allow us to obtain the diffusion length. A suitable reporter would provide: 1) proper band alignment with perovskite to form a type-I heterojunction, in order to facilitate photocarrier recombination; 2) similar crystal structure to perovskite, so that the implanted reporter does not disturb the original crystallinity of perovskite. Recent work has reported that lead sulfide (PbS) colloidal quantum dots (QDs) grow epitaxially inside perovskites and form a type-I heterojunction. We synthesized high-quality perovskite single crystals with QD reporters incorporated in them (Figure 2). In this way we determined the diffusion length within the perovskite single crystals (MAPbBr3) to be 2.6 ± 0.1 μm. Remarkably, multiple independent measurements agreed with one another to within 6%. Figure 2. 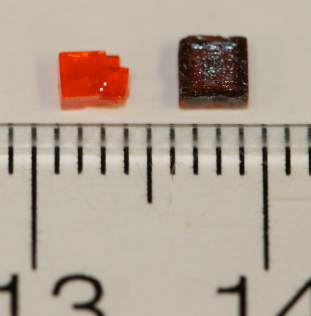 Perovskite single crystals with (right) and without (left) quantum dots. The new method and new materials reported herein contribute to the understanding of perovskite materials; give quantitative information on their further promise in solar cells (Figure 3), LEDs and lasers; and provide an attractive new diffusion length measurement method for the use of the wider optoelectronic materials community. For more details, check out our paper “Contactless measurement of accurate diffusion length on perovskite single crystals” in Nature Communications (https://doi.org/10.1038/s41467-019-09538-7). Reference:  Deveaud, B. et al. Enhanced radiative recombination of free excitons in GaAs quantum wells. Phys. Rev. Lett. 67, 2355–2358 (1991).